This evocative region with its rugged coastline and charming little villages oozes with culture and lush vines, a place where rustic and contemporary elements nestle side by side. Situated in the western shores of Cyprus, villages such as Drouseia, Ineia, Kathikas, Pano and Kato Arodes invite you to visit their windswept vineyards. Get to know the Xynisteri, an indigenous grape variety that grows in a climate tempered by the sea breezes, offering cool yet solid wines with a fine aroma, ranked among the best white wines produced in Cyprus. 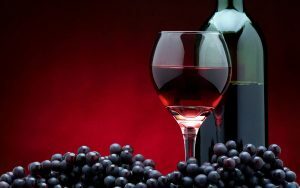 Sample the rare Maratheftiko, one of the best red wine varieties of Cyprus. We make our first stop. We turn off left at Mesogi, into the Industrial Estate, where we will visit the “FIKARDOS” winery. One of the first regional producers, owner Theodoros inherited the family tradition of winemaking, adding to them state-of-the-art equipment and modern skills. Although owning no vineyards, he has long-term contracts with local growers, resulting in a reliable flow which enables the winery to produce a large range of table wines. Fikardos offers both “varietals” (made from just one grape variety) and blends of several grape varieties. Taste across the range, such as the “Valentina” rosé, the white “Amalthia” and “Alkisti” and the red Shiraz. The winery is open to visitors every day and offers a good perspective of the area’s wine-making capabilities. Across the road from the Industrial Estate, you can find the nice village of Mesogi, known for making cane baskets, which you can buy from local shops. Before we continue our exploration, we can make an interesting side visit to the Monastery of Agios Neofytos the Recluse. Take the turning off the B7 at the top of Mesogi. Drive through the village of Tremithousa, passing an area of considerable beauty that leads to a road through a verdant valley. The monastery is in a beautiful location at an altitude of 412 meters. The site is enhanced by a marvellous square surrounded by sycamore, cypress and poplar trees. The Chapel carved out of the rock in which the hermit saint (1134-1214) lived, is well preserved. After this, we return to the B7 and continue to the village of Tsada. It’s a picturesque place, with both traditional and modern buildings sitting comfortably together. The stone-built fountains, by the names of Gerolakkos, Rodkias and Pyadkia, have a folklore beauty. Here you can enjoy pleasant views of the sea, across vines and plantations. Tsada is an important viticulture village in the region. Now to continue our travel… The road up to Stroumpi twists and turns, with scenic views upwards and down into gorges. The village is sited at an altitude of 450 meters and is deeply involved in vines and wine. Anyone accustomed to open flatlands with millions of vines is surprised at Cyprus’s tiny vineyards. They are frequently planted on steep slopes, necessitating the use of donkeys or mules to bring out the grapes. More than a thousand of them are still working on the island. Here the predominant grape varieties are the Mavro-red and Xynisteri-white. The Mavro, a low-acid grape, is being phased out, with high-acid varieties planted in its place. Every year, in August, Stroumpi organizes the Grape Festival “Dionysia” – a good event to go to! In Stroumpi you may see a number of churches, all of some architectural, historical or religious interest. One kilometre from Stroumpi, on the road to Polemi, lies the “KAMANTERENA” Winery of the Co-operative organization SODAP. It is the largest wine plant in Cyprus. A functional building with thoroughly modern equipment, a range of successful wines is made here. Millions of bottles of its “Islands Vines” are exported to Britain, and a number of interesting blends (such as Riesling-Xynisteri) are made. The medium priced “Mountain Vines” (the red based on mostly Cabernet Sauvignon and the white on Xynisteri with a little Semillon) is worth trying. residents) and to another hamlet called Giolou. There is a small restaurant here where you will probably remember the wine, but more especially the fresh bread! As we move on our Wine Route so onto Kathikas, set in a patchwork of vineyards, trees and stone walls. It is an area with plenty of photo opportunities. Spreading out from a square housing its Church, the little streets of Kathikas enchant the visitor with small houses, shops selling local produce, as well as places to eat. Kathikas has two wineries, both worth a visit. “K&K VASILIKON WINERY” on our Wine Route has an excellent reputation for its two staple wines. The white “Vasilikon” is fresh, fruity and ideal with local seafood. The red “Ayios Onoufrios”, blended from Mavro, Mataro, Cabernet Sauvignon and Grenache, is a best-seller. The Kyriakides brothers, who founded the winery, produce 300,000 bottles annually. Their wines are made from grapes grown in their own vineyards. Visitors are welcome by appointment and may taste the wines and tour the winery. On the other side of the village, you find “STERNA” winery on our , Wine Route a popular destination, where people happily sit on the terrace sampling wines and enjoying the food. Here the cave where the wines are stored is a very genuine one, around 2,000 years old. At weekends your guide could well be the son of the producer Panagiotis! The winery’s range features pungent, earthy wines, which suit local specialities. The grapes come from 140 acres of privately owned vineyards. to our left that leads to several picturesque villages. Stops to gaze and take in the scenery are called for, with lots of photo chances, too. sitting and talking, other times playing Tavli (Backgammon), seem to shout at each other -but this is just the way people converse! One kilometre north, in Kato Arodes, you can view the oblong vaulted Community Office, which seems like a church without a bell tower. Carrying on we come to the village of Ineia, where the view to the sea is breathtaking -the slope shelves gently down to the coast of Akamas… In Ineia, the traveller will note that the signs are old-fashioned, denoting the village as “Oinia”, indicating its origin from the Greek word for “Wine”. Just a little up the road is Drouseia village, a popular destination for tourists. Set in rolling hills with lovely views all around, it is a great place for a weekend, with hotels, restaurants, taverns and shops. Needless to say, there are vineyards all around. Among Drouseia’s attractions is the Textile Museum. 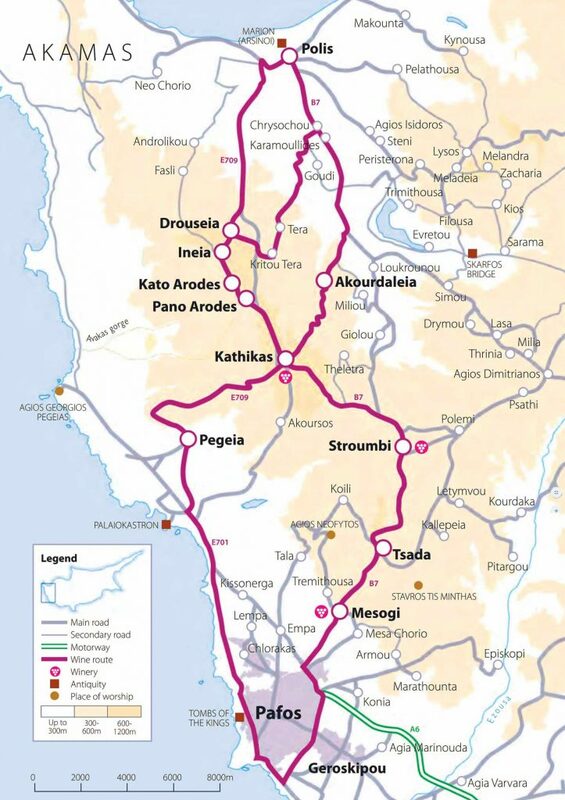 Instead of taking the road to Polis out of Drouseia, we can go back to the E709 and cross it to visit Kritou Tera. “Park and Walk” is the motto in this traditional settlement of narrow streets. The water-driven mill and the old coffee shop with its murals are things that will live in our memories as we turn back to drive the few kilometres to Polis. This is where our Wine Route ends. There is plenty of choices here for an overnight stay, to review the sights, sounds and people we have encountered during our journey, and the food and drink we have partaken. Polis is a modern coastal town with many tourist amenities, including water sports, sailing, fishing and sporting. On the return drive to Pafos, we may, if we want, take a right turn at Kathikas to go to Pegeia, a vibrant small town at the edge of the steep escarpment and the coastal road with its many hotels and restaurants. As you see there is plenty to see and taste on this Wine Route. It is well worth taking it.